The American Film Institute in Los Angeles, California, in mid-June 2000 selected America's 100 Funniest Movies with a blue-ribbon panel or "jury" of more than 1,800 leaders of the American movie community including actors, directors, screenwriters, editors, cinematographers, historians, film executives and critics. 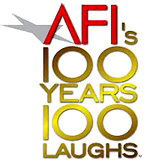 AFI's 100 Years...100 Laughs revealed America's 100 funniest movies, as chosen by leaders of the entertainment community, in a three-hour television event, that aired on the CBS Television Network in mid-June 2000. According to the AFI, these are "the films and film artists that have made audiences laugh throughout the century." See also this site's sections on the Comedy Films Genre and the Greatest Comedies of All Time and Funniest Film Moments and Scenes.